Your definition of “tea” largely depends on where you were raised, and perhaps how much BBC television you watched as a child. For some, tea is a steaming mug of English Breakfast with milk and sugar sipped in a coffee house while tapping on a laptop keyboard. For others, it’s a delicate cup of matcha accompanying a platter of sushi. To some, “tea” means a decadent, mid-afternoon splurge at The Plaza, plates towering with ornate pastries, delicate cookies, and scones slathered with strawberry jam and clotted cream. And for others, it means a light early evening meal of sandwiches, cold meats, pickles, fish, and maybe a little cake. So, when this month’s Lets’s Lunch challenge of “High Tea” was announced, my imagination ricocheted from definition to definition to definition. Once the image of a gooey square of Millionaire’s Shortbread bounded through my brain, though, all other thoughts went out the window. Have you ever tasted this decadent wonder? A base of buttery shortbread, topped by a layer of oozy, rich caramel, covered by a final layer of chocolate? If you have, you know why I’m lamenting the fact that I made the ones pictured above some weeks ago and there are no more in the house. If you haven’t, well, then… allow me to introduce you! I first tasted Millionaire’s Shortbread when we visited Scotland a year ago this month. On a trip full of wonderful things, Millionaire’s Shortbread was a standout. 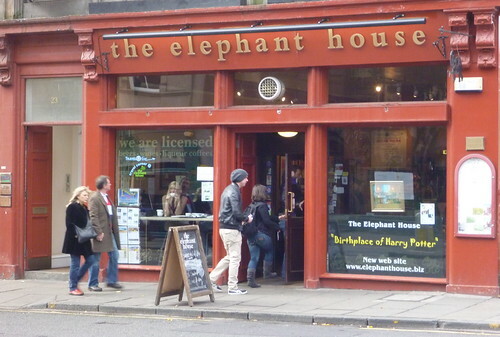 We sampled it wherever we found it, but our favorite incarnation was served here, at The Elephant House, where JK Rowling began to write a story about The Boy Who Lived. I’m sure someone sells these treats in our part of the planet, but I haven’t seen them in any bakery windows near me. So I decided to learn how to make them myself. Fortunately, they are blindingly simple to make (which is a good thing considering how quickly they disappear). They are particularly easy if you have a source of ready-made caramel sauce (many grocery and specialty food shops sell dulce de leche in jars), but making your own caramel sauce isn’t hard at all (you can see an easy recipe here, among many other places). This morning there was frost on the ground and a thin layer of ice on the water buckets in the barn. I have a fire going now, and the caramel-colored dog has rolled himself into a tight donut beside it. I have a mug of black, black tea sweetened with honey. Although I don’t have any Millionaire’s Shortbread in the larder, I’m planning on sharing tea today with my fellow Let’s Lunchers. I can’t wait to see what they bring to the table! With a rack in the center of the oven, preheat to 350°F. Put the flour and salt in a bowl and blend with a whisk. Add the butter and stir with a fork until just combined, forming a soft dough. Gently pat the dough into a 9-inch square baking pan. Don’t press hard. Small holes and gaps are fine. Bake for about 25 minutes, until it is just turning slightly golden and the surface looks dry. Allow the shortbread to cool while you prepare the other ingredients. If the caramel is cold, warm it gently in a double-boiler, hot-water bath, or microwave oven until it is pourable. Pour the caramel over the shortbread base, tipping the pan to spread the caramel evenly. Refrigerate the shortbread and caramel while you make the chocolate layer. In a small saucepan, bring the cream or milk to a boil. Remove from the heat, add the chocolate, and stir or whisk until the chocolate is smooth and shiny. This will take only a minute or so. 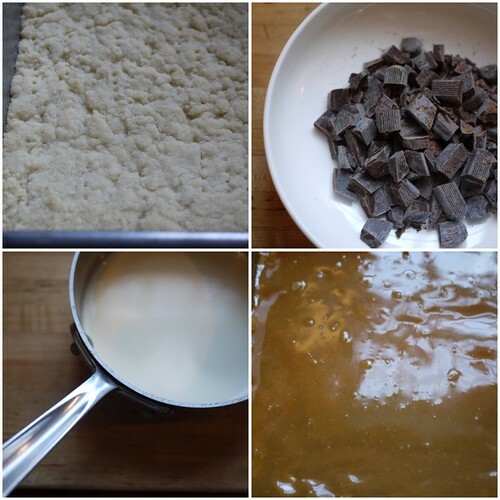 Allow the chocolate to cool for a few minutes, remove the shortbread pan from the refrigerator, and then pour the chocolate mixture over the caramel layer, tipping the pan to spread the chocolate evenly. Refrigerate for at least 3 hours, then cut and serve. Kinda loving this. A lot. Thanks for sharing! Better still: salted caramel layer. I knew just from the picture it was millionaire’s shortbread. I’ve never made it out of an extraordinary victory of prudence over gluttony (as I don’t think I’d be able to exercise self control). I had it in Scotland when my sister was studying abroad there. Seriously–that stuff is unreal. I’m going to pretend I didn’t read you saying they are blindingly simple to make. Mark just loved these when I made them with you a few weeks ago, and you are right, they disappeared with alarming speed….probably should make him another batch this weekend and maybe take some down to the swimmers for their first swim meet on the 14th…oh, yes, these can be gifted any number of places. Confession: I made a tiny small pan without the chocolate on top and those were great, too…and very very messy! 🙂 YUM! Oh my goodness. Are you kidding me? I’m pinning this – it looks like HEAVEN!!! So yummy! Oh, so glad to help! Dulce de leche to the rescue! This is wonderful! You can’t really go wrong with sugar, butter, and chocolate, can you? That first picture is drool-worthy! I love shortbread, caramel and chocolate. 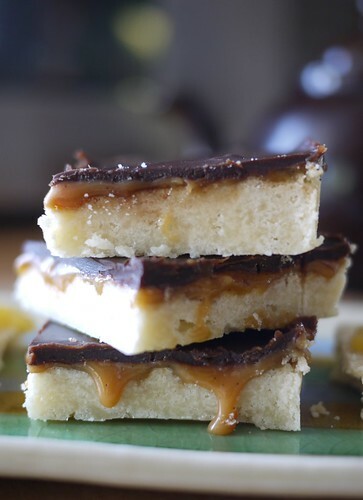 Once, I tried a recipe similar to this called “Toffee Bars” but I like “Millionaire’s Shortbread” much better. hmmm. Toffee bars don’t sound half bad 🙂 There’s another similar recipe called “Turtle Bars” (included pecans). Getting soooo hungry thinking about it…. The title alone intrigued me… and then I saw the photos. WOW! This sounds amazing. I am excited to revisit high tea because of all the wonderful LetsLunch ideas. This might just have to rise to the top of them. Thanks for sharing! LOVE having afternoon tea. English b’fast with lots of cream and sugar is my fav, but I am flexible. These look fantastic. Thanks for the recipe. Will be making these SOON! !